Despite Wednesday's stunning arrests of several FIFA Executives, Sepp Blatter predictably absolved himself of responsibility in the alleged rampant financial wrongdoings and pledged to clean up football's governing body. 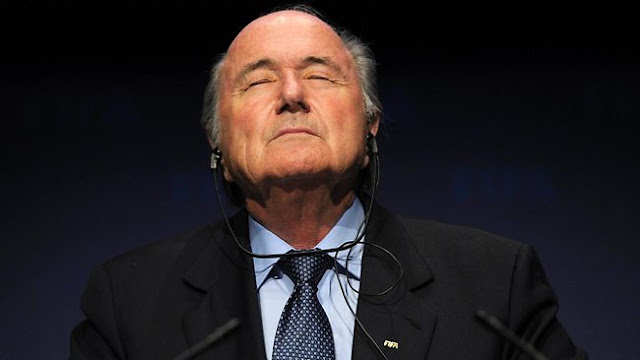 As the majority of the world that's not getting, alleged, backhanders from FIFA rolled their eyes, Blatter continued on with ramblings about football only having only a few bad eggs and his eyes can't be everywhere. Although his speech consisted of his typical of brand of farcical noble waxings, it didn't quite measure up to some of his more outlandish or offensive quotes of the past. "We now have three ladies on the board. Say something, ladies. You are always speaking at home, say something now." "I'd say they [gay fans] should refrain from any sexual activities." "There is no racism, there is maybe one of the players towards the other, he has a word or a gesture which is not the correct one, but also the one who is affected by that, he should say it's a game, we are in a game. At the end of the game, we shake hands, this can happen, because we have worked so hard against racism and discrimination."